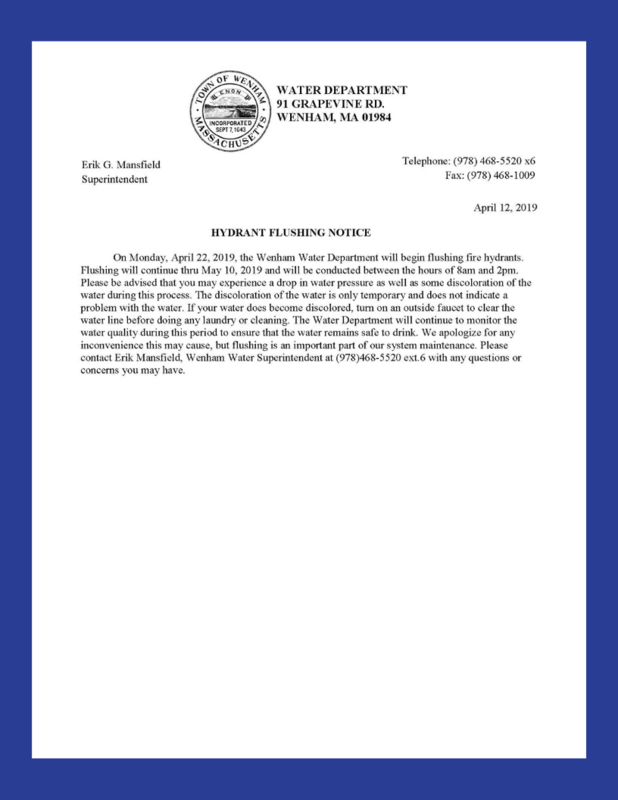 On Monday, April 22, 2019, the Wenham Water Department will begin flushing fire hydrants. Flushing will continue thru May 10, 2019 and will be conducted between the hours of 8:00am and 2:00pm. Please be advised that you may experience a drop in water pressure as well as some discoloration of the water during this process. The discoloration of the water is only temporary and does not indicate a problem with the water. If your water does become discolored, turn on an outside faucet to clear the water line before doing any laundry or cleaning. Please contact Erik Mansfield, Wenham Water Superintendent at (978)468-5520 ext.6 with any questions or concerns you may have.